IRSD members have a unique opportunity to gather their expertise and to structure research task forces around their common interest: a better understanding of the digestive tract physiology. Our common mission is to conduct and support medical research and research training, and to disseminate new knowledge and practices in digestive health. The scientific strategy of the institute as a whole will follow several axes. 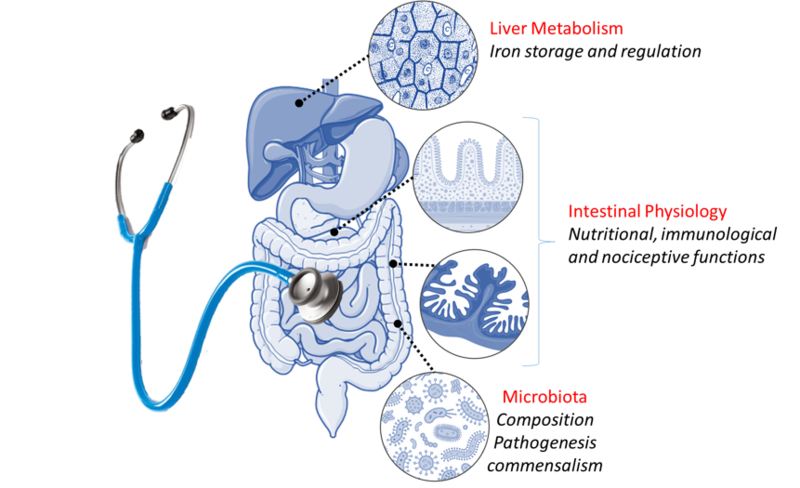 IRSD expertise lies in the physiology and pathophysiology of the digestive tract, covering major functions of the intestine and the liver. More specifically, members of the IRSD have gained considerable expertise in nutrient (glucose, lipids, iron) absorption, liver metabolism, intestinal pathophysiology, microbiota physiology (composition, pathogenicity, commensalism) and host-microbes interactions, but also nutrient, immunological and nociceptive sensing functions of the intestine. Different pathologies are studied in IRSD.